Zaheer Khan has the air of a man on the prowl. When on the field, his every step is measured. He saves his energy for the final act - the kill. He has an almost intuitive knowledge of when to bust his gut and when to take it easy. He is not present at every training session and he did not train on the eve of this Test either. He may have been in the gym, or running somewhere else, doing yoga or doing nothing. His team lets him be. His team-mates know Zaheer has sorted his game out, that he is sufficiently motivated and aware of his fitness levels. They know that they need not bother about him. It shows in how many times MS Dhoni lets Zaheer be the captain on the field. He has gone through bad phases in his career, largely due to fitness problems, and he seems to know the value of what he could miss out on if he isn't 100%. So there is a new-born dedication in his approach which may not always be obvious. He is also mature enough to know when to preserve his energy. Today, though, was not the day for energy conservation. If there was going to be a period with low intensity, it was going to be Zaheer's first couple of overs, while he sorted out his run-up. Bowling with the Wellington wind behind him, Zaheer must have realised he didn't need his run-up to be of usual length to work up enough momentum before hitting his delivery stride. He ran in from where the marker was originally placed only for one delivery and finally settled for a run-up of about 10 paces. During the time Zaheer was settling into his new run-up, Ishant Sharma had been struggling for line and length while bowling into the wind, and the New Zealand openers seemed to have had it easy. Martin Guptill had looked especially good while hitting a couple of boundaries. In his fourth over, Zaheer switched his line to round the wicket and immediately bowled Guptill with sharp inward movement and bounce. His intensity did not drop during an eight-over spell and the speed varied between the late 130s and the early 140s (kmph). Zaheer's extra effort did not escape Ross Taylor's attention. "He had an extra yard up today, but looking up at his speed it was quite normal," Taylor said. "But he bent his back and hurried the batsmen up. He bowled extremely well, and deserved this five-for." Zaheer has been India's standout bowler right through the series, getting early breakthroughs with his control and away movement without relying on inswing. However at the Basin Reserve, a venue that aids swing bowlers, Zaheer found his inswinger and the challenge he posed to the New Zealand batsmen grew significantly. Tim McIntosh was lucky to survive an lbw shout, after being put in two minds by the previous delivery, which moved away from the left-hander. Daniel Flynn was not as lucky for he edged the away-going delivery. Post lunch, a recharged Zaheer bowled another inspired spell which nipped any hopes of a comeback that McIntosh and Taylor may have harboured. McIntosh got an unplayable delivery that lifted off a length and took the edge. Jesse Ryder succumbed to temptation and pressure, and nicked a short and wide ball as he tried to uppercut. It was not a ball that should have got Zaheer a wicket, but he had bowled many until then that should have. At that point it was four out of four for him. His fifth wicket - Tim Southee - was because of a bouncer and Zaheer ran towards midwicket to catch the top edge himself. He flung the ball in the air and roared in delight as his team-mates gathered around him. 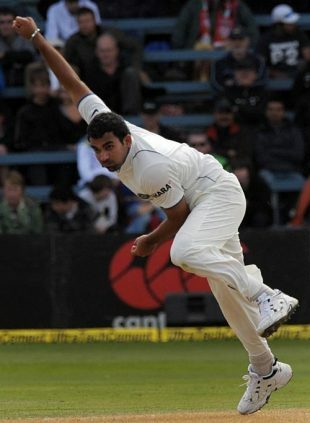 Zaheer had hunted his seventh five-for and was taken out of the attack even though New Zealand had two wickets in hand. He had caused severe damage and it was now time to cool down. Zaheer also uses his experience to develop his team-mates' fast bowling skills. Ishant Sharma spoke of how Zaheer helped both him and Munaf Patel. He said that by the time he had started playing, Zaheer had already made his comeback after being dropped. "He is much more experienced than us," Ishant said. "He knows how to adapt to conditions much better. He also tells us how to bowl and, whenever we make mistakes, he comes up and tells us what we should do." When Zaheer fell out of the Indian team a few years ago, the early comparisons with Wasim Akram were sounding silly. Now, though, given Zaheer's repertoire, his ability to size up a situation, his knack of raising his game when required, and, most symbolically, his skill from round the stumps, maybe it's time to start that comparison again.